Directed by Shane Black and stars Robert Downey Jr. and Val Kilmer.Robert Downey Jr. is a thief who is lucky enough to escape from the police being confused with an actor in a casting.Bang is the word to describe the acting of Robert Downey Jr., having a really good performance for a funny character. Robert Downey Junior here is Harry, a bumbling small time thief who through a series of coincidences and misunderstandings finds himself sent to LA for a movie audition where he is instructed to 'research' his role with the tough as nails gay Private Eye Perry (Val Kilmer in a scene stealing turn). Perry and Harry though soon find themselves in over their heads when they come into possession of a murdered girl's corpse and pursued by kidnappers, while at the same time getting mixed up with Harmony (the gorgeous Michelle Monaghan), a struggling actress whose sister has just recently committed suicide. The ensuing plot may be rather difficult to follow on first viewing, but this is a film that rewards repeat watches as there are always great lines to pick up on that you may have missed first time. 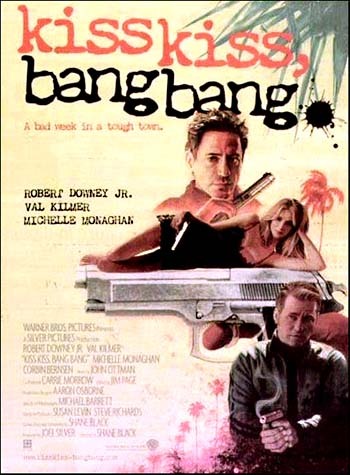 Rather than focusing on action this explores the comic and indeed genius pairing of Val Kilmer and Robert Downey Jr.Clever, fun, witty, rich characters...I could go on but I'll leave by saying, if you like to laugh... love a good pace, cleverness and wit, then go see Kiss Kiss Bang Bang.